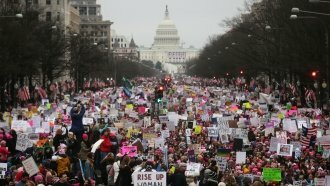 Thousands of women, men and children marched from the Lincoln Memorial to the White House to mark President Donald Trump's first year in office. Thousands of people showed up in Washington, D.C., to march from the Lincoln Memorial to the White House. Many expressed their frustrations with President Donald Trump and his first year in office.